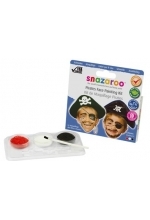 Brilliant for fancy dress parties, games and matches. 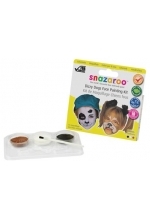 These packs make great gifts, party favours and are ideal pocket money purchases. Popular characters for parties and celebrations. Each pack contains 3 x 2ml colours and a mini-brush. Paints up to 10 faces. Going paintballing? Dressing up as a soldier? Contains: 3 x 2ml classic colours (Black, Gr.. Contains: 3 x 2ml classic colours (Black, White, Brown) with mini brush .. Contains: 3 x 2ml classic colours (Pink, Purple, Light Grey) with mini brush. People wh..
Leopard, Lion, cat, dog, animals, aged make up, wrinkles, age spots, etc. Contains: 3 x..
For pirates, dalmations, sporting themes and national flags. Trinidad and Tobago, Yemen..
Can be used for sports teams. Country flags - Australia, Cambodia, Chile, Cook Islands,..